The excitement is virtually palpable when summer comes around. It’s a time to revel in the weather and rejoice. And every summer comes July, which mean it’s also Social Wellness Month. A perfect time to look into your social life outside of the office. Social Wellness Month is a great time to nurture and revive your social-self. At first, you may consider the topic of social wellness to be pointless to you overall well-being. However, finding social activities to participate in outside of work can greatly impact your productivity, morale, and happiness during the work day. Who knows? Maybe you might even learn something that can help you in the office. Your social wellness is a surprisingly vital component to your health. Studies have shown that people with stronger social networks will tend to live longer. Without those strong social bonds, health risks with similar symptoms to obesity and tobacco addiction can occur. In general, those with strong social networks have blood pressure and heart rate that respond better to stress, as well as better immune systems. Many often wonder how to best grow their social network. It may seem like a daunting task, but is not as difficult as it appears. Volunteer: A great way to increase your social network during social wellness month is to give your free time away. 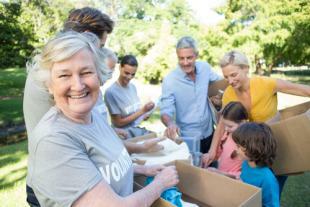 Volunteering is a great way to help the community, increase your social wellness, and perhaps meet people along the way. Pick up a hobby: Hobbies can also insert you into a niche of people similar to yourself. Whether it’s collecting, hiking, or biking, hobbies can often bring people together who may never have met otherwise. No matter how you go about making the most out of July and Social Wellness Month, just simply expanding your network of social individuals will make you feel better, and overall help you in life. Don’t ignore this truly important time to work on your self development.